Mount Kenya Wildlife Estate is 1,000 acres in the eastern corner of Ol Pejeta Conservancy. 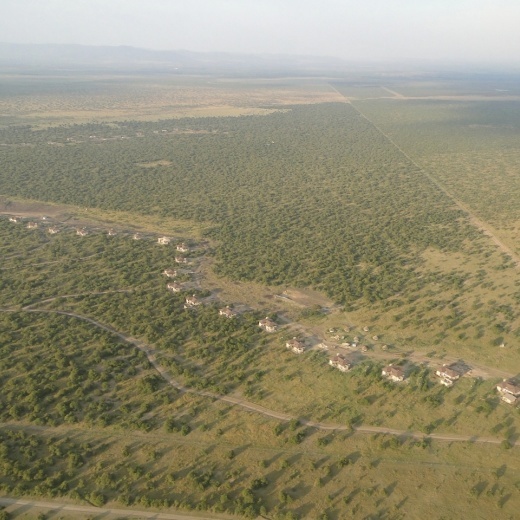 For the first time in Kenya, guests can now live in classic 5 bedroom (only 4 rooms rented out) homes in a wildlife Estate, adjacent to the world-renowned Ol Pejeta Conservancy. The animal-proof fence surrounding Mount Kenya Wildlife Estate gives visitors the freedom to roam on foot or bicycle along tracks through the bush, and to enjoy the tranquility of the wild. Plains game such as zebra, giraffe, waterbuck, Thomson’s gazelle, Grant’s gazelle and impala plus a huge variety of small game and birdlife live within the Wildlife Estate. The Wildlife Estate is a secure breeding and protection area for endangered species - Jackson’s hartebeest, Grevy’s zebra and Beisa oryx. In the safety of the Wildlife Estate, free of predators, precious breeding populations can be built-up and eventually used to re-stock suitable habitat in the wider Ol Pejeta Conservancy. Designed by one of Kenya’s leading architects, the spacious houses are clustered around waterholes and salt licks with sweeping views of Mount Kenya, Loldaiga Hills and Aberdare mountain ranges. Vistors will be able to walk, jog or cycle around 9 km of paths leading through the unfenced savannah and herds of plains game. There is a common swimming pool at the Club House. The whole Wildlife Estate has been carefully designed to give a unique opportunity to unwind in the bush, explore and mix with wildlife away from any vehicles, in safety, and in magnificent surroundings. What could be better than gathering some cold drinks, stepping out of your house, jumping into the car and minutes later be watching a pride of lions setting out to hunt as the sun begins to sink over the Aberdares? Very good facility. The host was nothing but fantastic. We had basically a fabulous stay.